Itule Produce – Artworks PHX – a business-arts campaign in Phoenix, Arizona USA. Willie Itule Produce gives “Heads Up” to connect the business of produce with art. So many things can be considered as art. Think of a meal: the chef preparation is an art, the presentation is an art, the meats, sauces, fruits and vegetables are the mediums. Few people appreciate those mediums quite like Willie Itule and his team at Willie Itule Produce. Their 80,000 square foot warehouse is home to a wide array of fresh produce that brings color and texture to a chef’s table. It’s also home to a number of produce-inspired art works. Several pieces in the Itule collection are commissioned and created by Phoenix-based artists John Babbit and Bob Price. The family owned and operated business has a flair f or creativity that is immediately evident to anyone who walks through the doors of Willie Itule Produce. 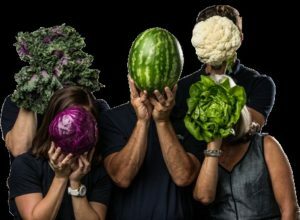 Visitors are welcomed by a family portrait lovingly known as “Veggie Heads” that is an arty homage to the fruits and vegetables they bring to businesses, schools and organizations throughout the state. The Itule art collection that is on display in the warehouse includes traditional art pieces that have been in the family for years. 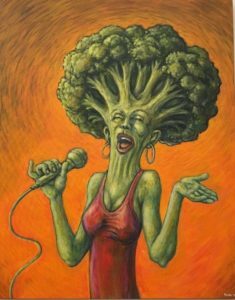 There are also pieces with a creative twist and titles like, “John Lemon, Give Peas a Chance” and “Broccoli Sings the Blues” by Bob Price that are intended to make people wink, smile and appreciate the lighter side of the produce business. Willie Itule, Founder and CEO of Willie Itule Produce, Inc.